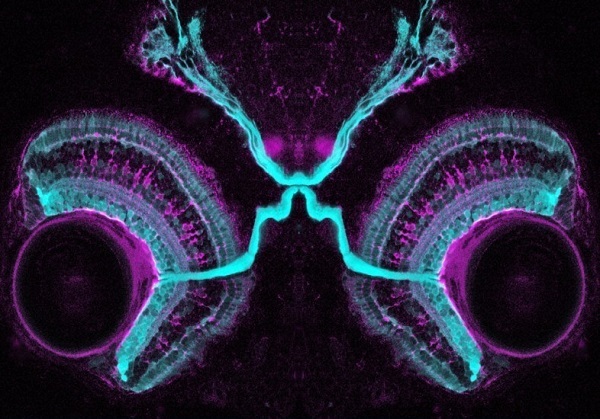 Confocal micrograph showing the connections of the visual system in a four-day-old zebrafish embryo. Staining of the neurons, glia, and optic nerve illustrate the connections between the retina and the brain. The retina is a multilayered structure of neurons that processes light information in the eye. The ganglion cell layer is closest to the bulb of the eye. The layer that contains the light sensitive cells—the rods and cones—is toward the back of the retina. Both the retinal ganglion cell layers and photoreceptor cell layers are shown in cyan. The glial cells are shown in purple. The optic nerve (cyan) transmits information from the eye to the brain. The point at which the optic nerves meet is known as the optic chiasm. This image (www.cellimagelibrary.org/images/39022) is by Kara Cerveny and Steve Wilson and is licensed under a Creative Commons Attribution, Non-Commercial, No Derivatives License. We are pleased to announce a name change: The Cell: An Image Library-CCDB is now the Cell Image Library. This reflects the full integration of the original The Cell: An Image Library with the Cell Centered Database into what is now truly one resource. We are still at http://www.cellimagelibrary.org. The Cell Image Library is now on Instagram. Check us out on Instagram at cell_image_library. Don’t forget, if you are applying for a grant soon and need a Data Management Plan (DMP) be sure to contact us before submitting your grant application so we can help with your cellular images’ DMP. The Cell Image Library (http://www.cellimagelibrary.org) is a freely accessible, easy-to-search, public repository of reviewed and annotated images, videos, and animations of cells. 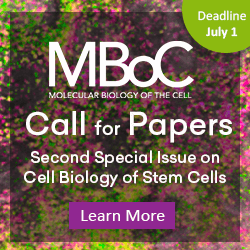 Portions of the Cell Image Library were developed by ASCB under a Grand Opportunities grant from the National Institute of General Medical Sciences and are now managed by the National Center for Microscopy and Imaging Research under a perpetual license from ASCB.